Pour voir ce courriel en franÃ§ais, cliquez ici. 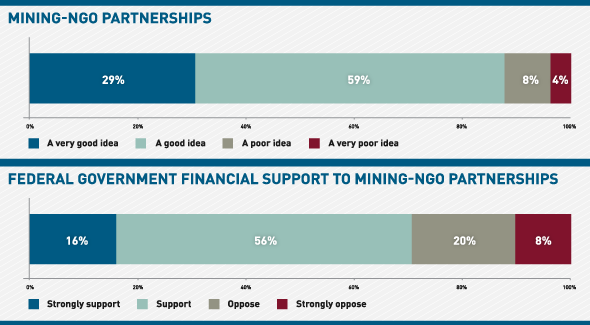 Canadian mining companies are agents of social and economic change at home and abroad. A number of MACâ€™s member companies are active internationally and are making significant environmental and community investments to provide critical services and support to local populations. Within developing countries, mining companies can make substantial differences in alleviating poverty and spurring long-lasting economic development. This edition of the newsletter takes a special focus on community investments that Canadian mining companies are making overseas. It includes some powerful examples of our membersâ€™ international investments, as well as other information, that showcase the positive role mining can play in the developing world. 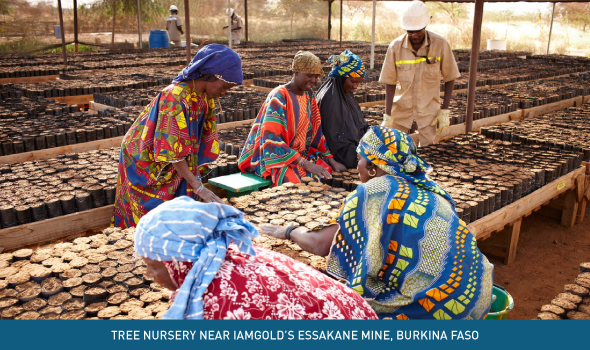 At its Essakane mine in Burkina Faso, IAMGOLDâ€™s biodiversity efforts have extended well beyond the mine site in an effort to help local communities reclaim the environment around their villages. Since 2009, IAMGOLDâ€™s ambitious Village Forest Program has helped to improve local biodiversity and the quality of silvopastoral areas severely degraded by previous deforestation and other human-related activities, particularly animal grazing. Since its inception, more than 100,000 trees have been planted in protected areas at the outskirts of various villages. In 2011 alone, the company worked with surrounding communities to plant 30,000 trees, all of which are native species. Many of the tree species also have special utilitarian or cultural importance to the local populations. Although the community forests are only a few years old, the trees are already providing a source of food, natural medicine, wildlife habitat and shade. The program has also demonstrated the positive outcomes that can result from a mining and community partnership, with its success largely attributed to its participatory and community-driven process. IAMGOLDâ€™s Village Forest Program was highlighted as a case study in the MACâ€™s latest Towards Sustainable Mining Progress Report. To download the report, please visit www.mining.ca/tsm. Since Teck launched its Zinc & Health program in 2011, the company has actively formed partnerships to help save the lives of children suffering from zinc deficiency. Nearly a third of the worldâ€™s population does not get enough zinc through their diet. As a result, more than a million children die annually from diarrhea â€“ more than AIDS, malaria and measles combined. The solution to treating acute cases of diarrhea is often as simple as a treatment of zinc tablets and oral rehydration salts. In addition to partnering with Free the Childrenâ€™s We Day events across Canada to raise awareness about zinc deficiency, Teck is also a major Canadian partner in the Zinc Alliance for Child Health (ZACH) initiative, which also includes the Micronutrient Initiative (MI), CIDA and two African ministries of health. Since the ZACH initiative launched in May 2012 in Senegal, it has provided 39,000 zinc supplementation treatments and successfully treated more than 8,000 cases. It was recently announced that the initiative will extend its reach to treat and reduce diarrheal disease in Ethiopia and Burkina Faso. This project will aim to treat more than seven million cases of diarrhea in children under the age of five over the next three years, as well as train healthcare workers and caregivers on proper treatment. The ZACH projects in these two countries represent a $5.6 million investment from Teck, MI and CIDA as part of a broader $20 million commitment to scale up zinc supplementation programming in at least five countries. To learn more about the ZACH initiative and Teckâ€™s Zinc & Health program, please visit www.zincsaveslives.com. About 125 families will escape the slums and shantytowns of Chileâ€™s Atacama region and will become homeowners for the first time in their lives, thanks to the Renacer program sponsored by Barrick, A Roof for Chile, and Chileâ€™s Ministry of Housing. Meaning â€œrebirthâ€, the Renacer housing program was created to provide permanent housing in safe neighbourhoods to families living in slums in Chileâ€™s Atacama region, which is home to Barrickâ€™s Pascua-Lama project. Announced in 2008, Barrick has provided multi-year funding of $4.3 million to A Roof for Chileâ€”a founding member of the initiativeâ€”and a local NGO whose mission is to eradicate slums and provide adequate housing for people living in poverty. A massive undertaking, the Renacer program took almost five years to complete. Before construction could begin, land for the housing development had to be found, building rights obtained and government support secured. Each townhouse cost $31,100 to build, or $3.88 million overall. Costs were shared by Chileâ€™s Ministry of Housing (83%), Barrick (13%) and the families (4%), who were closely involved from the beginning. As part of the program, families were also provided financial management and budgeting assistance. Beyond the programâ€™s central focus on providing housing, it also goes deeper to help address root causes of poverty in the region. With financial support from Barrick, A Roof for Chile was able to launch numerous initiatives that helped improve the lives of nearly 700 families through literacy, vocational and entrepreneurial training for adults, and providing loans to individuals starting small businesses. To date, 172 small loans have been provided, giving individuals the kick-start they needed to start up local businesses. 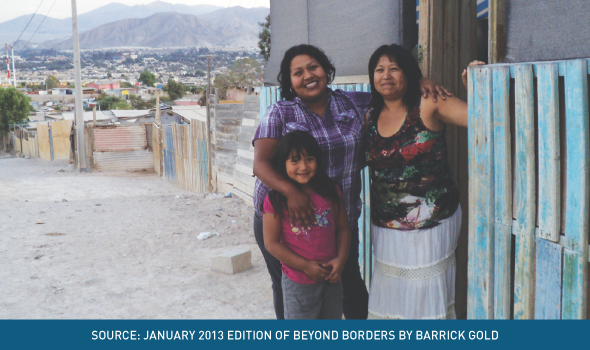 To learn how the Renacer program has impacted some of the families, please visit the Beyond Borders website to hear their stories at www.barrickbeyondborders.com. Canadians have a largely positive view toward the Canadian mining industry, according to the results of a recent public opinion poll commissioned by MAC and conducted by Harris/Decima. The poll was conducted in February 2013 and included a sample size of approximately 1,260 people across Canada. Consistent with last yearâ€™s polling results, Canadians (74%) have a largely favourable view of Canadian-owned companies. The poll also shows that Canadians recognize the industry makes a number of important contributions to society as a job creator, economic driver and provider of the materials found in valuable products that support their daily lives. The poll results also reveal that with mining comes great responsibility in the eyes of Canadians, especially to the environment, wildlife and the people that are touched by mining projects. There were interesting findings surrounding Canadian mining activity overseas. Recently, a number of Canadian mining companies have established partnerships with NGOs like World Vision, Plan Canada and the World University Service of Canada to collaborate on projects intended to benefit local communities in foreign countries where mines are being established. Canadians were asked how they viewed these partnerships and the response was overwhelmingly positive with 88% in favour of the collaborations. The poll also asked Canadians whether they agree with the federal government providing financial support for these partnerships and a majority of 72% were in support. Immediately preceding the PDAC Convention in March, the World Economic Forum and the Canadian International Development Agency (CIDA) held a global conference themed â€œMaximizing the Value of Extractives for Developmentâ€ the day before the worldâ€™s largest mining convention officially kicked off. The forum attracted about 200 leaders from government, industry and civil society to discuss the role of the extractive sector in sustainable development and included a keynote address from the Honourable Julian Fantino, Minister of International Cooperation, who hosted the event. MACâ€™s President and CEO, Pierre Gratton, was a panelist for a discussion centred on maximizing the development value of mining. 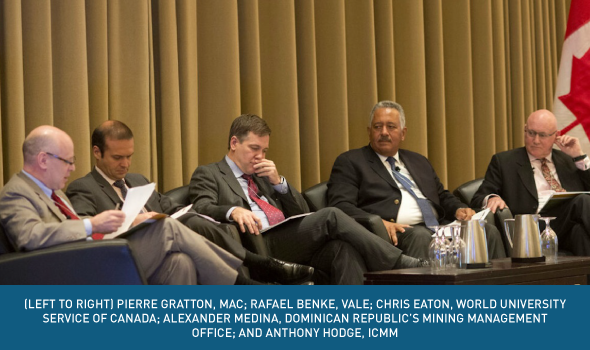 Gratton appeared alongside Rafael Benke of Vale, Chris Eaton of the World University Service of Canada, Alexander Medina of the Dominican Republicâ€™s Mining Management Office and Anthony Hodge of the International Council on Mining and Metals. Throughout the one-day conference, participants discussed the role that mining investments can play in developing local, regional and national economies and compared extractive resource management approaches in various countries. At its Pinos Altos mine in northern Mexico, Agnico Eagle is working closely with its neighbouring communities to develop alternative employment and business opportunities to help diversify the local economy. 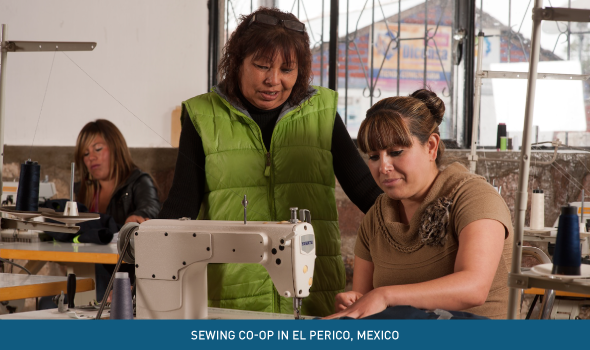 In the community of El Perico, Agnico Eagle helped a group of local women to start up a sewing co-operative to help fill the demand for clothing manufacturing from both the local mining industry and surrounding communities. Partners provided the machines and Agnico Eagle provided the fabric the women needed to make their first samples. The company also funded the training for the venture, provided by the Chihuahua State of Technical Training. The next challenge for the co-op is to start mass producing clothing and selling it to customers in a newly-built shop in El Perico, which will provide a permanent and alternate source of employment to mining in the area. A win-win for both the broader community and Agnico Eagle alike, the co-op has become a model for the development of a similar program in Arviat, Nunavut. Agnico Eagleâ€™s Meadowbank mine in Nunavut has signed up with the Arviat Kiluk sewing workshop, which will provide the company with a range of commercial sewing services, including repairs to work-wear. This example, among other investments made within the local community, is one of the reasons why Agnico Eagleâ€™s Pinos Altos mine has been certified as a Socially Responsible Company by the Mexican Centre for Philanthropy and the Alliance for Social Responsibility for Enterprises for the sixth year in a row. For more information on Agnico Eagleâ€™s recent investments in the communities where it operates, read its latest Corporate Social Responsibility Report at www.agnicoeagle.com. 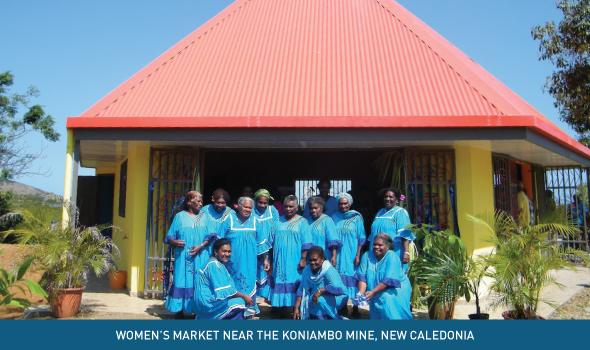 The Koniambo mine in New Caledonia, a joint-venture between Xstrata Nickel and the SociÃ©tÃ© miniÃ¨re du Sud Pacifique, has helped establish a strong local supplier industry and has assisted local populations to start up businesses independent of the mine. In 2011 alone, approximately 270 contracts and 9,800 orders for services related to construction, transportation and the environment were awarded locally. This totals about $1.4 billion in economic investments in New Caledonia, and surpassed the expected target of $1 billion. As a testament to the opportunities mining projects bring to communities where they operate, approximately 50 new companies have started up in the North Province in direct relation to the Koniambo project. The mine is located close to the Vavouto mangrove area, where women from the nearby Oundjo tribe harvest crabs as their main source of income. Koniambo saw an opportunity to help the women sell their goods. In 2011, Koniambo helped construct a market by providing financial and business training support so that local women could sell seafood, produce and handmade goods more effectively. Today, the market is independently owned and run by an association of women, who also selected the marketâ€™s location and supervised its construction. For more information on the Xstrata Nickelâ€™s community investments at its operations worldwide, please visit www.xstratanickel.com. The Cobre Panama project, located 120 kilometres from Panama City, is the largest private sector investment in Panamaâ€™s history. The 13,000 hectare exploration and mining concession is within the environmentally-sensitive Mesoamerican Biological Corridor, an area of high biodiversity value. Given its location, Inmet Mining is undertaking leading-edge biodiversity practices to limit its impact on the environment. Due to its climate and topography, Panama has a rich and diverse mix of plants, animals and geological resources. Cobre Panamaâ€™s environmental management plan will help minimize any negative impacts caused by the operation. For instance, Inmet intends to compensate for the loss of forest by developing an off-site reforestation program that would reforest two hectares for every net hectare of original forest lost. The companyâ€™s biodiversity plan also will help with deforestation unrelated to the mining project, including support for the management of two national parks and a new protected area of 290,000 hectares. Interestingly, as part of Inmetâ€™s ongoing environmental work, the company has even helped to identify numerous species of plants and frog that are new science. This is early evidence of how Cobre Panama would also contribute to the scientific knowledge of flora and fauna in the region through studies. For more information on Cobre Panama, please visit www.inmetmining.com. The International Council on Mining and Metals (ICMM) launched a landmark publication, The Role of Mining in National Economies, to analyze the growing role the industry plays in generating economic development and reducing poverty in regions where it operates, particularly in low and middle income countries. The report is a first of its kind and covers three main areas. Firstly, it provides a global context for miningâ€™s economic contribution by showing trends in the value of world mineral production. It also identifies major producer countries of which Canada is ranked tenth largest behind other established mining countries and large emerging markets. Secondly, it discusses the elements of miningâ€™s economic contribution at the national level by measuring trade and exports data for individual countries. As part of the study, 212 countries were examined using a Mining Contribution Index developed by ICMM. Lastly, the report examines the mining industryâ€™s growing role in many low and middle income countries in supporting economic development and reducing poverty among local populations. Evidence from case studies conducted by ICMM shows that foreign exchange earnings from mining can increasingly create positive developmental effects. In many countries, the mining and metals industry is gaining recognition as an important contributor to the critical policy objectives of job creation and poverty reduction. The report is part of a series of publications that describes mining and metalsâ€™ contributions to sustainable development. For more information or to download the publications please visit www.icmm.com. At the PDAC Convention in March, Natural Resources Canada launched the revised Exploration and Mining Guide for Aboriginal Communities. The guide replaces the previous version titled Mining Information Kit for Aboriginal Communities, which was published in 2006. The guide is geared for an Aboriginal audience and its purpose is to make the mineral development cycle and mining exploration activities more understandable and relevant to Aboriginal communities. Mining has been a part of Aboriginal communities and economies for generations, and many mining projects today are located in close proximity to Aboriginal communities. This guide helps to explain how Aboriginal communities can participate through employment or otherwise in mining exploration throughout the phases of mineral exploration and development. The mining sector is proportionally the largest private sector employer of Aboriginal peoples in Canada, and employment is poised to increase. Since 1974, 318 agreements of all types have been negotiated with Aboriginal communities, covering 185 different mining projects. Approximately 1,200 Aboriginal communities are located within 200 kilometres of 180 producing mines and more than 2,500 active exploration properties. The Exploration and Mining Guide for Aboriginal Communities was a partnership project between the Minerals and Metals Sector of Natural Resources Canada, Aboriginal Affairs and Northern Development Canada, MAC, the Prospectors and Developers Association of Canada and the Canadian Aboriginal Minerals Association. For a copy of the guide, please visit NRCanâ€™s website at www.nrcan.gc.ca. Each year, Natural Resources Canada (NRCan) marks National Mining Week, which celebrates the important role that the mining industry plays in the lives of Canadians. This includes miningâ€™s role in our economy, the jobs that directly and indirectly support the sector, and of course, the products we depend on in our daily lives in which minerals and metals are the building blocks. Canada is a global mining powerhouse. According to NRCan data, Canada produces more than 60 minerals and metals. We are also the worldâ€™s top producer of potash and rank among the top five producers of a wide range of commodities, including aluminum, uranium, nickel, platinum, diamonds, and zinc. Mining in Canada â€“ Did you Know? Mining contributes more than $35 billion to Canadaâ€™s GDP and accounts for 23% of total goods exports. Mining companies pay billions of dollars in taxes and royalties to Canadian governments each year. In 2011, this figure amounted to more than $9 billion. More than 320,000 people are employed in mining across Canada and a projected 145,000 new workers will need to be hired over the next decade to replace retirees and fill new positions. The industry supports the second-largest supply sector in the world behind the United States with more than 3,200 businesses supplying services to the mining industry, including engineering, construction and financial services. Canadaâ€™s mineral production value in 2011 reached a record $50.3 billion. In 2012, value declined to a still strong $46.9 billion due to some softening in the commodity market. However, this figure essentially represents a return to the previous peak level of 2008. National Mining Week also complements other provincial mining weeks that take place across the country throughout the year. Together, these weeks help to underscore the mining industryâ€™s fundamental role in our national economy and in virtually all regions of Canada. To learn more about the Canadian mining industry and its contributions to Canada and abroad, read our Facts & Figures 2012 Report at www.mining.ca. More information on National Mining Week is available on NRCanâ€™s website at www.nrcan.gc.ca. MAC is the national organization for the Canadian mining industry. Its members account for most of Canadaâ€™s production of base and precious metals, uranium, diamonds, steel making coal, mined oil sands and industrial minerals and are actively engaged in mineral exploration, mining, smelting, refining and semi-fabrication. Copyright Â© 2013 Mining Association of Canada, All rights reserved.